This boy can swim a whole length of the pool on his back and on his front, can float on his back and his front for at least twenty seconds without moving at all, can jump into the pool, do a sitting dive, dive down to pick things off the bottom of the pool, tread water, but perhaps his strokes are not perfect, yet. This is also a child who after a good start, refused to go into the water at all for a whole year. Instead he just came to watch his brother’s lesson. I knew that something must have happened to make him frightened and eventually he told me that he had gone under the water and felt he couldn’t breathe. This was not in my class. It happened when he was with another teacher. Eventually after watching my class for a few months he asked if he could join in. When they are frightened of the water the children often say things like, ‘I might sink to the bottom’ or ‘I might drown’ or ‘I won’t be able to breathe’. I am trying to help them develop the skills they need to overcome these fears and manage themselves in the water, without help, and in a way that they feel comfortable with. This is not a matter of just desperately thrashing your way from one end of the pool to the other. Learning to swim takes a long time, for adults and for children. There are many stages to go through. At first a non swimmer wants to remain upright and has some difficulty with stretching out in the water. 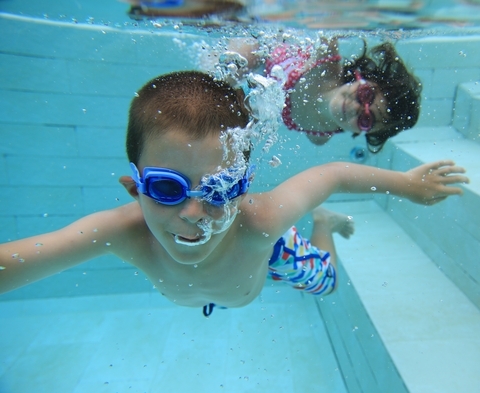 Many people, adults as well as children, don’t want to put their faces in the water, but an ability to do this is an absolutely basic requirement for good swimming. Then without experience it is impossible to understand the exact amount of force or pressure it takes to move oneself through the water. Balancing in the water is different from balancing on land, this must be learned too. In order to learn the strokes properly you need to learn the elements that go into each one. When a child is confident in the water, learning the strokes is easy. The parents I love best are the ones who allow their children to develop the skills gradually through exploration and play. The irony is that it is the children who are allowed to play who learn the quickest. I see time and time again, when the parents apply pressure, the children have to resist, in order to keep themselves safe and the whole thing takes much, much longer. The only thing that seems to spoil the experience of learning swim is the pressure to achieve. This can take away all the joy. I want to say to many of my adult pupils, slow down and learn to play in the water, then you will learn to swim. This entry was posted in Fear of water, learning to swim, learning to swim as an adult. Bookmark the permalink. Oh yes I have been there Jane. It has in many ways been the hardest part of the job for me to learn to accept that parents will say these things because that is what the watching world expects and to also know that very little credit may land at my feet because visual skills count more than the emotional capital required to perform them. I just smile now inside, knowing that I have done a good job for the vulnerable learner when things could have been so different for them because their parent just does not get it. This I feel is where the ‘Science base’ underlying the aquatics industry is letting everyone down because sooo many parents need to relearn what they should be expecting from swimming lessons.